Ontario Equestrian (OE) proudly presents KidsZone, a new interactive program for young equestrians. KidsZone has been created to provide the equestrian community with an exciting, safe, interactive play place for children, friends, and families. Hosted at Caledon Equestrian Park (CEP), KidsZone is an area for kids to experience, learn and play. 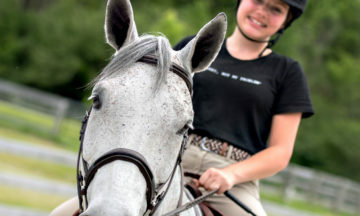 There will be multiple activities for children to engage in including a horseless show jumping course and the newly launched Rookie Rider program. Rookie Rider will allow children to learn the fundamentals of riding by testing their physical literacy skills on a barrel prior to ever mounting a horse.